Ashley Brandon (pictured) and Dennis Hohne produced Punches & Pedicures as students in Wright State’s Motion Pictures program. Victor Pham is anything but ordinary. A few years ago, he escaped gang life by moving to rural Defiance, Ohio. By day, he gives manicures and pedicures out of his salon. By night, he coaches mixed martial arts fighters. Pham’s inspiring story has been seen by thousands across the country with the help of two Wright State University alumni. He stars in Punches & Pedicures, a short documentary produced by Ashley Brandon and Dennis Hohne, both of whom graduated in 2013 from Wright State’s Motion Pictures program. After being screened at film festivals through the United States and winning a number of regional voting rounds, Punches & Pedicures has been nominated as a finalist in the Documentary category in the prestigious 41st Student Academy Awards. The Student Academy Awards were established in 1972 to support filmmaking at the collegiate level. The competition brings together student filmmakers from all over the country to compete for awards and cash grants. Three winning films are selected in each the competition’s five categories. Past Student Academy Award winners, like Spike Lee, Trey Parker, Pete Docter and John Lasseter, have since gone on to bigger and better cinematic success. 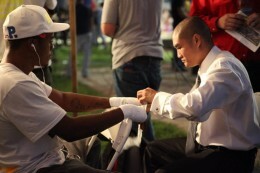 A scene from Punches & Pedicures, a documentary about a Vietnamese immigrant who teaches troubled youth mixed martial arts out of a nail salon. After Pham eagerly agreed to cooperate with Brandon and Hohne, the production for Punches & Pedicures was in full swing. The final result of Punches & Pedicures turned out to be much, much more than what Brandon initially saw. What started as a story about a man with an unusual occupation with an even more unusual hobby eventually became an inspiring tale of success, courage and triumph over unfavorable circumstances. Brandon said Pham’s philosophy is that everyone has significance and that it is always possible to change your lot in life. She said Punches & Pedicures really works to convey that. “I feel that Punches & Pedicures should win Best Documentary at the Student Academy Awards because we’re different,” said Brandon. 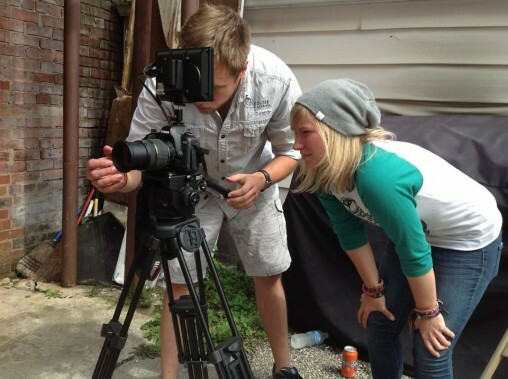 The training and education Wright State’s Motion Pictures program provided Brandon and Hohne made their success possible, she said. The Student Academy Awards ceremony will be held June 7 at the Directors Guild of America Theater Complex in Los Angeles. The ceremony is free, but advanced tickets are required. Tickets can be obtained at www.oscars.com.